Sfondi per tutti!! E calendari! E inspirational quotes! In poche parole, questo è quello che ho scritto profusamente in inglese qui sotto. Mi sono divertita a pasticciare con carta, forbici e pennelli per creare dei "freebies" da scaricare gratuitamente (trovate i link in fondo al post). Here's a little November treat for you all. 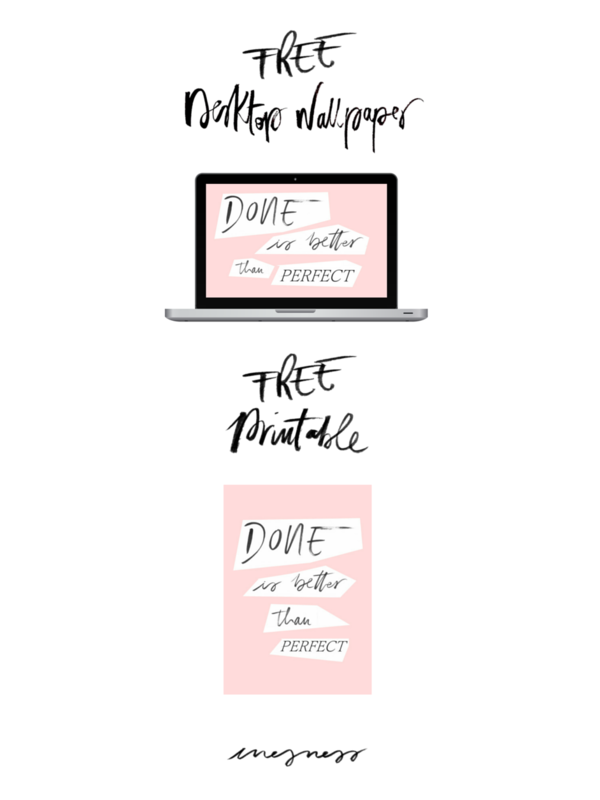 It's a bundle of many things I love and have always wanted to try my hand at making: calendars, printables, brush calligraphy, desktop and phone wallpapers, pastels + my favourite pale pink colour (you will see it pop up A LOT in my works), paper collage, etc. 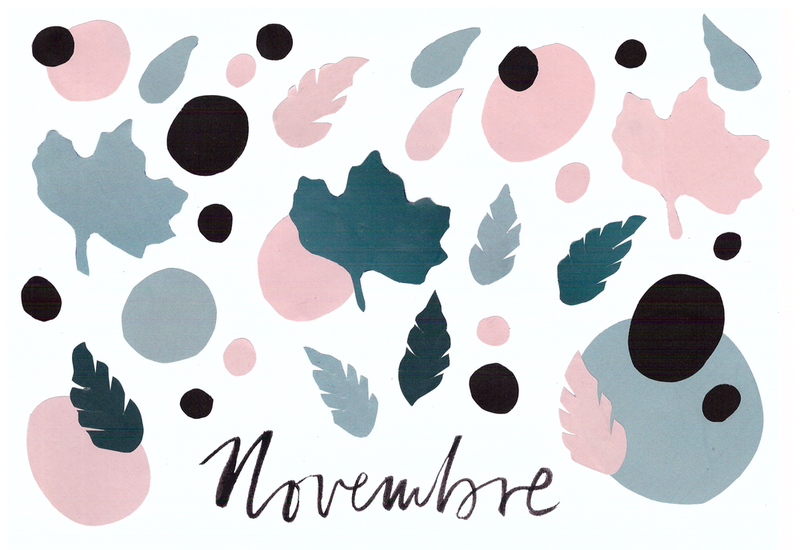 It all started from the downloadable calendar (here the current month, but I'm thinking of making a whole calendar for 2016), which was inspired by DesignLoveFest moodboard calendar: each month has blank space at the top of the page for you to customise. Write down To Do's and birthdays, important tasks or goals; stick a picture up with washi tape; use it to doodle while you're on the phone; create a mini moodboard tearing pictures from magazines or printing them from the Internet; leave it as it is for a minimal, no-fuss calendar.. It's totally up to you! You could also get crafty and create a collage, which is what I did. It's kind of a Lotta Jansdotter meets Matisse meets Marimekko (it definitely has a Scandinavian influence) meets this picture meets Ines Provana (that's me). I wanted to keep with the autumn theme, hence the leaves. I tore solid backgrounds from old fashion magazines, starting with the pale pink shapes (duh! ), then I used the teal and a darker shade too - we are going towards winter after all. Throw in a little black, which is my go-to pairing with pink, instantly making it less girly, and ta-da! I scanned everything and liked the pattern so much I decided to turn it into free downloadable wallpapers (links at the end of the post). Please bear with my non-existent Photoshop skills, which result in the wallpapers being the actual scans, no post-editing (I might do it later.. I wouldn't mind turning this into a fabric or gift-wrapping pattern). This means you can easily see the print lines and rough cut edges of the paper shapes but hey, "Done Is Better Than Perfect" - this is my new motto. 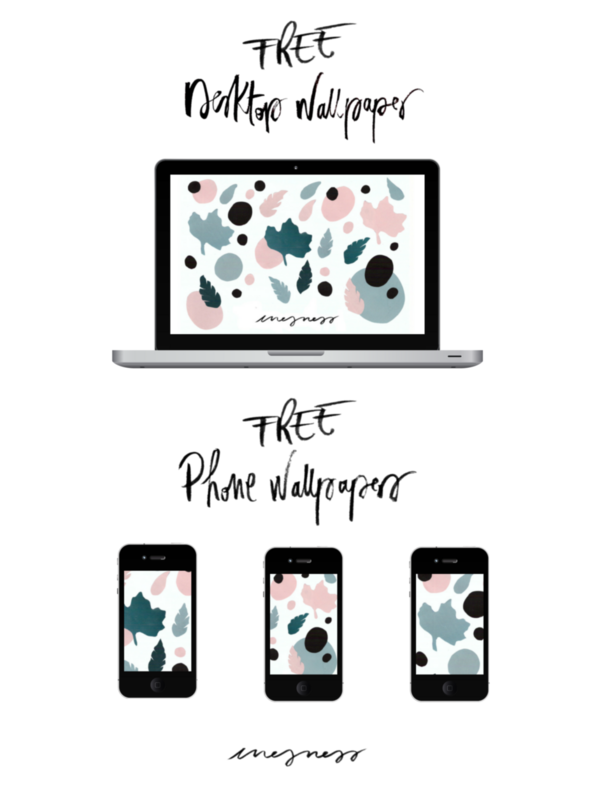 Which I turned into another desktop wallpaper and printable - I'm on a roll this week!So, without further ado, here are all the links to your free goodies, hope you like them and will use them to brighten up your desks, walls, phone and desktop screens - that would make me so so happy!